on the web for unusual patterns. And let the beauty and delightfulness and favor of the Lord our God be upon us; confirm and establish the work of our hands - yes, the work of our hands, confirm and establish it. We sell Quilt Patterns & Cross Stitch Patterns and now a Book! Tips on taking care of animals are free! 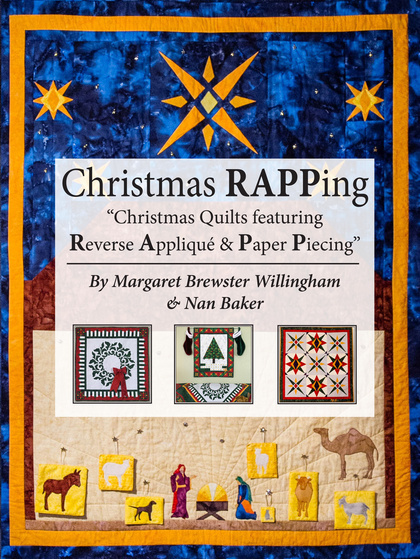 - Christmas Quilts featuring Reverse Applique & Paper Piecing"
Two talented women from the quilting world have joined forces to bring you a new book! Margaret Willingham of Eye of the Beholder Quilt Design and Nan Baker, Marketing Director for The Quilt Pattern Magazine and Purrfect Spots Designs have combined their distinctly different styles in Christmas RAPPing, Christmas quilts featuring Reverse Applique and Paper-Piecing. The ten plus projects vary in size from table runners to wall hangings to full size quilts and even Christmas tree decorations. There are multiple quilt size options and alternative color variations. The variety of designs all include the unique Star patterns found throughout the book. Two projects include interactive quilts that can be great for helping children young and old start the countdown for Christmas Day! All the designs feature Reverse Applique and Paper Piecing so you can learn new techniques using the book’s easier, more streamlined methods. The patterns in this book reflect the individual styles of both Margaret and Nan blended together to create gorgeous quilts to celebrate the Christmas season. They hope you enjoy making their quilts and find your Christmas favorites which will become family heirlooms. Caring for Animals Safely in Emergencies during the Year! Click here under "Purrfect" Spot to contact us! Purrfect Spots Designs will not be able to provide patterns to the following EU countries due to the VAT regulations: Austria, Belgium, Bulgaria, Croatia, Republic of Cyprus, Czech Republic, Denmark, Estonia, Finland, France, Germany, Greece, Hungary, Ireland, Italy, Latvia, Lithuania, Luxembourg, Malta, Netherlands, Poland, Portugal, Romania, Slovakia, Slovenia, Spain, Sweden and the UK. This is due to circumstances beyond my control. If anything changes, I will certainly let you know and adjust my website immediately.